It prevents headaches and migraines before they even start. BOTOX® prevents on average 8 or 9 headache days and migraine/probable migraine days a month (vs 6 to 7 for placebo) at 24 weeks. It’s given every 12 weeks. It will take 2 treatments, 12 weeks apart to determine how well BOTOX® is working for you. If you don’t get treated every 12 weeks, you may not get the full benefit of BOTOX®. It’s a small needle. People say that the injections feel like tiny pinpricks. It’s injected by a BOTOX® specialist. This is a doctor who’s experienced in treating with BOTOX®. It takes about 15 minutes. The injections take about 15 minutes, and are done right in your doctor’s office. Botox a purified and diluted form of botulinum toxin A, a toxin produced by a bacteria, which is responsible for botulism. Botulism is a deadly food poisoning most known for its paralyzing effects on the muscles, including the muscles responsible for breathing. How Does Botox Prevent Migraines? Researchers noticed that many migraine sufferers who had Botox injections for wrinkles reported having fewer migraines. It’s unknown exactly how the Botox reduces migraine frequency, but it only seems to be effective in those with chronic migraines, not with those who suffer from episodic migraines or chronic tension-type headaches. Although, future studies on using Botox for chronic tension headaches may prove otherwise. bridge of the nose, the forehead, the temples, the back of the head, the neck, and the upper back (just above the shoulder blades). Botox is injected over a ten to fifteen minute period into the muscles around the bridge of the nose, temples, forehead, back of the head near the neck, and upper back. The procedure may burn a bit, but the discomfort is short-lived and generally well-tolerated. Botox is used as a preventative medicine, requiring treatments every 12 weeks to work most effectively. Botox was approved to treat chronic migraines in October 2010. Prior to that, it was used off-label for this purpose. Botox is also approved for use in certain disorders of the eyes, torticollis, and facial wrinkles. In addition, it’s used to treat severe forms of overactive bladder and underarm sweating. The injections take about 15 minutes, and are done right in your doctor’s office. The needles used for BOTOX® treatment are very small. People say that the injections feel like tiny pinpricks. BOTOX® is injected into shallow muscles, not too deeply beneath the skin. Each treatment involves 31 injections in 7 key areas of the head and neck. BOTOX® is the first and only FDA-approved preventive treatment for Chronic Migraine. It’s also the only treatment for people with Chronic Migraine that can help prevent headaches and migraines before they even start. What makes BOTOX® a different type of treatment? Unlike acute treatments, which are taken to treat a headache or migraine once it’s already begun, BOTOX® prevents headaches and migraines before they even start. BOTOX® prevents on average 8 to 9 headache days and migraine/probable migraine days a month (vs 6 to 7 for placebo). And for people with Chronic Migraine—people who live with 15 or more headache days a month—that can make a big difference. In general, the current standard of care for the treatment of chronic migraine with Onabotulinum toxin type A (Botox®) is injections every 12 weeks. It is generally worthwhile having at least two treatment sessions to assess treatment response. If individuals have not responded by two to three treatment sessions it is generally considered that the individual is a non-responder. As experience increases with the use of Botox® as a preventative treatment for chronic migraine some clinicians are identifying that longer periods between injections may sometimes be acceptable. The choice of 12 weeks between treatments with Botox® for chronic migraine is largely based on the pivotal research studies that were used to gain its treatment approval. In day-to-day clinical headache practice it is not unusual to vary the duration between Botox® treatments in some patients. Experience has shown that some individuals not only gain benefit over the 12 weeks following their last Botox® injection, but also sometimes for further weeks afterwards. In such scenarios doctors who administer Botox® may suggest increasing the time intervals between injections. However, it is difficult to generalise about such decisions as they are often made on an individualised basis. In general terms cranial Botox®, or Botox® for other conditions, is usually administered approximately every 12 weeks due to the treatment response being considered more reliable over this time period. It is unfortunate when patients experience a wearing off effect of any preventative treatment effect 10 to 12 weeks after the last injection, but the logistics of care delivery i.e. clinic capacity, staff availability or other factors are sometimes responsible for extending the time between injections. There is no good evidence to suggest that cranial Botox® is less likely to work if delayed more than 12 weeks. In fact, in patients who may be considered equivocal or borderline Botox® treatment responders, some headache clinics choose to wait a further month or two beyond 12 weeks to assess whether any relapse to more frequent migraine occurs compared to the immediate few months post treatment. This sometimes allows an assessment about whether further Botox® is actually needed. According to a new analysis of data from the PREEMPT (Phase III Research Evaluating Migraine Prophylaxis Therapy) trials, published in 2010 and involving 1,384 adults with chronic migraine, among those who received Botox injections, about 70 percent reduced headache-days-per-month by at least half by study-end at week 56. Treatment success is typically defined as migraine frequency and/or severity reduction of at least 50 percent. Botox-maker Allergan sponsored the trials and analysis. Botox is not a one-size-fits-all procedure, says Dr. Lal. Consider these factors when deciding whether it’s right for you. Botox is injected into 31 sites around the head in a five-to-10-minute procedure administered at a doctor’s office. Though the mechanism is not fully understood, Botox is thought to prevent certain chemicals from reaching nerve endings, thereby reducing migraine pain. Effectiveness emerges roughly one week post-injection, peaks around six weeks, and fades around three months. In small doses, Botox is not poisonous to the body. Botox is not the go-to treatment for migraines. It’s usually considered after having had poor results with other migraine treatments (for example, at least two prescription medications, from two separate medication classes). Most insurance companies cover Botox treatments if two medications were tried, both for at least two months, without migraine improvement. Botox injections are FDA-approved to treat people who have migraines (lasting four-plus hours) at least 15 days each month. One or two Botox treatments typically aren’t enough to assess responsiveness, says Dr. Lal. While some see improvements after one treatment, she says, patients often need at least three treatments, spaced three months apart. If, after consulting your doctor, you wish to explore Botox treatments, request a referral to a neurologist or headache specialist experienced with this procedure. In rare cases, symptoms similar to botulism have been reported after using Botox. The exact rate of these reactions is not known. The most common adverse effects associated with chronic migraines receiving Botox included neck pain and headache (go figure—this is still relatively rare though, only a few people out of a hundred). Botox is a Pregnancy Category C medication, meaning there is not enough research to determine if it is safe to use while pregnant. Your obstetrician will need to help you determine if the risk of using Botox is greater than the potential benefit of treatment. Botox injection is a safe, relatively simple technique that can be used to prevent chronic migraines. The good news too is that it’s not an all or nothing approach. Rather, it’s often used as a complementary treatment, meaning you can probably still take your abortive migraine medications as needed, and potentially even your migraine preventive medication—the double whammy approach could be your best bet. A total of 10-30 U should be sufficient for this area. The patient is instructed to contract the areas of concern to demonstrate the approximate location of the hyperfunctional muscle. The injections are divided into 2- to 4-U injections. Most authors recommend that all injections be at least 1 cm above an imaginary line drawn horizontally between the middle portions of the eyebrows to avoid brow ptosis. An imaginary vertical line is drawn passing through the pupil for a reproducible reference point. The first injection of 3 U is placed 1.5 cm above the superior bony orbital rim on this imaginary line. The second injection of 3.0-3.5 U is injected at a point 1.5 cm superior and 1.5 cm lateral from the first injection. The last injection uses the same dose but is injected 1.5 cm superior and 1.5 medial to the first injection. In effect, this creates a letter V. This set of injections is repeated on the opposite side. The injections are massaged in a direction away from the orbit (see image below). This region can be divided into 2 areas. 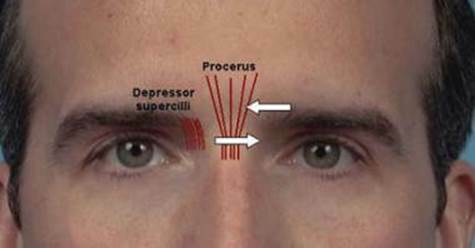 The superior-lateral region is the first area, and it is affected by the corrugator supercilii muscle. 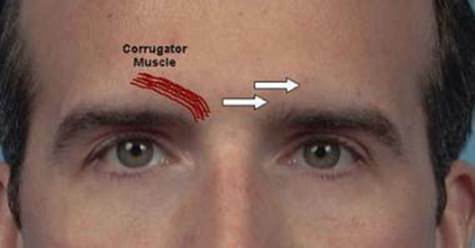 This muscle is responsible for the vertical furrow between the brows. Each muscle receives an injection of 10 U as follows: 5 U is injected into the medial portion of the muscle near its origin, and 5 U is injected in the mid portion of the muscle belly (see image below). The central and inferomedial regions comprise the second area, and they are affected by the procerus muscle and depressor supercilii muscle. These muscles are responsible for the horizontal furrow at the root of the nose. A 6-U injection is placed into the middle of the procerus muscle belly, which is slightly off the midline (approximately 7 mm) and at the level of the superior orbital rims. The same injection is repeated on the opposite side. Then 3 U is injected into the depressor supercilii muscle, which is approximately 1 cm above the medial canthal tendon (see image below). Finally, 3 U then is injected on the opposite side. Great care must be taken not to inject the solution too deep, which may place BOTOX® into the orbit, causing an oculomotor paresis. Periorbital crow’s feet: A total of 12 U is used per side. Injections are divided into 3 U each. Using the patient’s right eye as an example, the first injection is approximately 1 cm lateral to the lateral canthus at the outermost portion of the bony orbital rim. This correlates approximately with the 10-o’clock position of the orbicularis oculi muscle (some authors feel that this injection provides a chemical brow lift of several millimeters in the lateral brow region). This is followed by an injection of 3 U at the half-past-9 position. The last 2 injections are placed at the half-past-8 and half-past-7 positions (see image below). Once again, the BOTOX® must be placed outside the orbital rim to avoid intraorbital complications . Orbicularis muscle/periorbital crow’s feet injections. Nasolabial: This area has been difficult to inject and offers mixed results. Electromyograph (EMG)–guided injection of 2-3 U to paralyze the levator labii superiors plaque nasi has demonstrated some success. The authors’ center does not use botulinum toxin in this area because of complications of upper lip paresis. 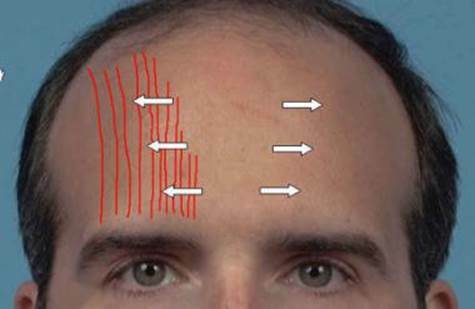 Platysma: Platysmal bands can be treated with the direct injection of botulinum toxin into the concerning band. Once the band is identified, 5 U can be injected at 1-cm to 3-cm intervals along the vertical line created by the platysma. Some authors find these areas more amenable to surgical treatment. Historically, some authors had chosen to perform their injections under the guidance of EMG monitoring. This technique involves using a 27-gauge (1.5 in) polytef-coated EMG needle connected to an EMG recorder by an alligator clip on its shaft. The patient is asked to contract the muscle in question. The injection is placed where the maximal EMG recording can be found within the muscle. This technique ensures that the injection is at the portion of the muscle that is contributing most to the hyperfunctional facial line. As these injections have become routine, many centers have obtained satisfactory results without EMG guidance. Many physicians use a readily available 30-gauge insulin syringe instead. If a patient feels that little benefit was derived from the original injection, reinjection can be performed 1 week postinjection. However, 2-3 weeks postinjection is probably a more practical time for a return clinic visit. Generally, 2.5-5 U are used for reinjection. Reinjection strategies are still evolving. Once the patient has a satisfactory result, the next visit is at 2-3 months or when the patient requests another treatment. A randomized, double-blind study by Carruthers et al supported the efficacy of repeated botulinum toxin A treatments in reducing crow’s feet, as measured via the Facial Winkle Scale and patient-reported outcomes. Among patients who received the drug for treatment and then, in a 5-month extension of the original 7-month study, retreatment of crow’s feet alone or of crow’s feet and glabellar lines, the response rates were 56.5% and 63.6%, respectively, compared with just 1.1% for patients who received placebo. A study by Lee et al indicated that in lower facial contouring via bilateral injections of botulinum toxin A to the masseter muscle, better aesthetic results are achieved if the patient undergoes two injection sessions instead of just one. In the study, which involved 20 patients, individuals in the two-injection group received the doses 4 months apart.